Andrew Hall played as a member of the Melbourne Symphony Orchestra as a casual musician before successfully auditioning for a role in the Second Violin section in 1996. Born in Melbourne Andrew began violin lessons at the age of seven, later taking up the piano and viola whilst still in primary school. 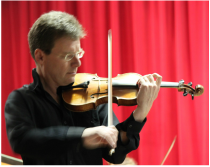 After studying with Nathan Gutman, Andrew joined Orchestra Victoria in 1990. In 1994 Andrew left Australia for 12 months to study in London with Rodney Friend before returning and working as a freelance musician for the Tasmanian Symphony Orchestra, Academy of Melbourne and Australia Pro Arte. After completing a Diploma of Music at the Victorian College of the Arts and a Bachelor of Fine Arts at Melbourne University, Megan spent a number of years in Sydney, performing with ensembles as diverse as the Australian Chamber Orchestra, the Philharmonia of Sydney and the Seymour Group. On her return to Melbourne, Megan played with the Melbourne Symphony and as a permanent member of the State Orchestra of Victoria (now Orchestra Victoria). She has vast experience as a member of the Australian Pops Orchestra and played for musicals such as Cats, The Wizard of Oz and The Phantom of the Opera. With a keen interest in chamber music, Megan played as a member of the Goossens String Quartet in Sydney, the Southern String Quartet in Melbourne as part of the Musica Viva In Schools program and The Macedon Trio. Megan has wide experience as a teacher and currently teaches cello at The Peninsula School in Mt Eliza. Marney began playing the flute when she was in Grade 6 and continued playing throughout her school life. When she finished high school she attended both the University of Melbourne and the Victorian College of the Arts, completing Bachelor of Music degrees in both performance and education. Marney has studied the flute with Wendy Clarke, William Bennett, Peter Edge and Eileen Gilligan. She has performed with the Australian Wind Symphonia, Melbourne City Opera, Grainger Symphony, Peninsula Chamber Musicians and with many chamber ensembles. Marney has also completed a Masters in Gifted Education, and is interest in how music and instrumental education can be used to enhance learning. She currently works at Woodleigh School as a flute teacher and classroom music educator. Graduating from the Victorian College of the Arts in 2000, Paul Jenkins also holds a Masters in Music and Graduate Diploma of Education from Monash University. Paul studied primarily under Kate Stockwin and Ian Morgan, but also pursued further study with David Griffiths, Paul Champion, Robert Schubert and David Thomas. As a clarinetist, Paul has performed with many ensembles including Melbourne Youth Orchestra, Melbourne Opera Orchestra, Australian Discovery Orchestra and has worked in many 'scratch orchestras' for various projects. Throughout his studies and career, Paul has focused his attention on performing many of the great chamber works for clarinet and has completed research into compositions by Johannes Brahms, Darius Milhaud and Miriam Hyde. As a multi-instrumentalist, Paul performs frequently on instruments from the flute, saxophone and oboe families, in musical theatre, chamber ensembles and community orchestras. Paul founded Peninsula Chamber Musicians Inc. in 2013, in an effort to inspire and reinvigorate chamber music on the Peninsula. The aim, to connect musicians, students and community. Paul currently teaches woodwind at Padua College. Kevin began playing the trumpet at the age of 12 when he started at high school. At the end of that year he saw a picture of a French horn in a music book and decided he wanted to try one. His teacher, Don Webster, found a dilapidated old “Lark” brand horn for sale which his parents bought for $50. Over the next few weeks of the Christmas school holidays, Kevin worked his way through the Tune-A-Day horn books 1 and 2, doing almost nothing else but play this old horn. It eventually fell apart in the New Year requiring Kevin’s uncle to urgently solder it back together. It was a good job, just not pretty and it lasted long enough for Kevin to win a music scholarship to Scotch College a few months later under George Logie-Smith MBE. At Scotch, Kevin’s horn teachers were Ted Hellier, David O’Meara and Tom Nicoll. Kevin was the first brass player to obtain his AMEB A.Mus.A. Diploma whilst still a student at the school. He also graduated to a much nicer horn and began getting a few professional “gigs” with the Victorian State Opera and the Victorian Concert Orchestra whilst still at school. Also students at Scotch during this time were the now internationally acclaimed pianist Ian Munro and violinist Yuki Mori (who now lives and plays violin in the USA). Together with Kevin they regularly performed the Brahms Horn Trio. Kevin performed the Strauss Horn Concerto No. 1 in his final year at school and he was also selected to perform at a masterclass given by the great American horn player Phillip Farkas in Melbourne in 1981. Kevin then went on to study music performance at the Victorian College of the Arts from 1982 to 1985. His teachers were Gordon Webb, Tom Nicoll, Graeme Evans and Hector McDonald. (Kevin would travel up to Canberra as often as he could to get lessons from Hector.) Kevin also performed at masterclasses by Hermann Baumann, Barry Tuckwell, Meir Rimon (Israel Phil) and Peter Cripps (LSO) during this time. After finishing at the VCA, Kevin became a busy freelance musician in Melbourne. He spent most of his time in professional theatre shows or in the recording studio and credits include professional productions of Nine, Cats, Phantom of the Opera, Nicholas Nickelby and recordings with Channel Nine Orchestra, Kids in the Kitchen, The Models and various other commercial, film and TV recordings. Kevin has performed with the Melbourne Symphony Orchestra, Orchestra Victoria, Australian Pops Orchestra, Bolshoi Ballet, Great Moscow Circus, Rantos Collegium and Australian Army Band Melbourne. He has been a member of various professional chamber music ensembles including Faculty Brass Quintet, Brass Parts and Aeolus Wind Quintet. Kevin continues to be an active freelance musician in Melbourne. More recently he has performed with Patma Music (Musical Detective Series), Melbourne Opera, The King & I, Normie Rowe, Silvie Paladino and recorded for Australia’s Got Talent, Melbourne band Saint Jude and Melbourne All-Star Horns. Kevin is also an active participant in community music and is proud to be a member of the Peninsula Chamber Musicians.